Shoe seeking contact with monitor screen scrapes along a gregarious computer exterior whose normally thin film of signs and hints usually appeals either to the intelligence or simply -- and perhaps this is closer to the truth -- an abject sense of administrative order. Here it is: the long-awaited flickering monitor screen you can touch with the feet as opposed to keyboard-tapping fingers. Access to the computer is a fraud engineered our faculty of sight, a deception users meekly tolerate as long as they are kept at arm's length from the fluorescent rectangle. 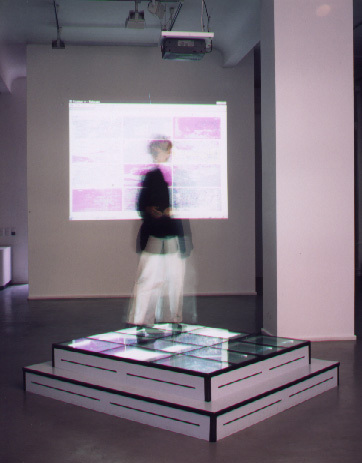 But now the lived body steps onto the projection surface of its inhabitant's desires, and for once the users are on top of the desktop - courtesy of Joachim Blank & Karl Heinz Jeron. Or so it seems at first. Actually, they're standing not on the monitor but on its symmetrical counterpart, the scanner -- a reading device that with schematic, flat abandon digitizes graphic images and documents, then feeds them into the computer. 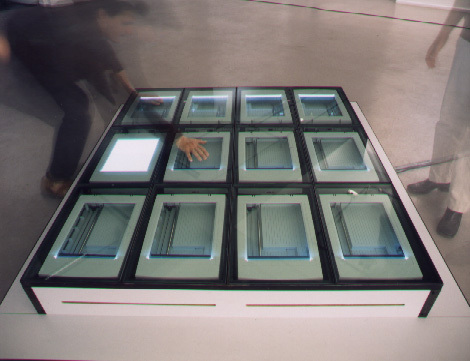 Scanner++ is the name the artists gave to a catwalk composed of a dozen panes of glass, each one the size of a school-issue drawing block. Beneath them is the same number of flatbed scanners, all recording the world in treadmill rhythm. The captured world is 20 centimetres shallow - copying machines being short-sighted devices that precisely reproduce any object in the immediate vicinity but reduce to impenetrable black blobs anything more remote. Mindlessly obeying an algorithmic choreography, the machine plots and maps out its overhead audience of shoe-soles, while the heads of the shoe-wearers remain exempt from mechanical reproduction. Blank & Jeron's touchy-feely apparatus thus dictates the conditions under which its users' physiques are rendered legible. In some peculiar way, Scanner++ is a mechanical disciple of the faded utopia once cherished by the pioneering generation of Internet enthusiasts. Just as the latter dreamt that the nascent global electronic network would liberate its community by disembodying it, the human embrace of Scanner++ is indiscriminate, interested solely in people's proximity to the technical surface, and reads into the brief encounter nothing more than data and characters. Imprinted on the computer's sensory organ are merely the footsteps of random flaneurs: solid enough, but devoid of the idealistic superstructure. Following a mathematical scheme, the apparatus generates snapshots of a spatially truncated reality, images the state-of-things from a mechanistic, limited viewpoint. 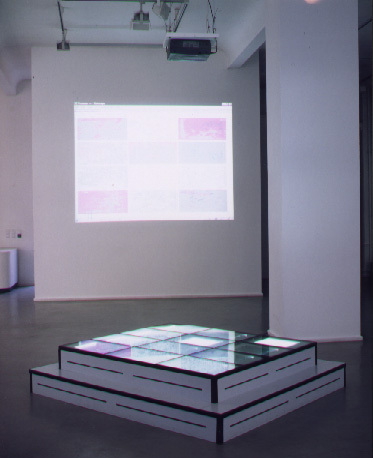 The copies are projected onto three sets of four surfaces on the wall opposite the scanners - the arrangement mirror-images the installation - and simultaneously made accessible over the Internet on a monitor. A screen is presented to us as a mirror behind which, apparently, there are people standing. We see them from below, the soles of their feet stare at us from the monitor. Senseless visual aids glued to our screens. Yet they don't really look like the flies that sometimes settle on our monitors. Our rudimentary technologies turn physical objects into abstract schemes, and in front of us is a selection menu. Each of the twelve fields is really a stack of pictures, not unlike a deck of cards, the image visible at any one time merely topmost in a chronologically ordered pile. The user can pick up one picture, then discard it and move onto the next, curious to know if there are better prospects in store. Blank & Jeron somewhat snidely term such systems SERO, which is an abbreviation for the German word 'Sekund\E4rrohstoffverwertung' ('recycling of reusable waste materials'). SERO was a byword for recycling in the GDR, and still figures in the name of the company that has operated the privatized system since German re-unification. Quick to learn the rules of the free market economy, its stock has soared thanks to what it calls 'individually tailored, technically mature recycling concepts' (1). It is also the brandname Blank & Jeron use for their projects, and can be read equally as their substitute for the overused term World-Wide Web or a metaphor for their criticism of information technology. SERO is the description and analysis of a medium which, derived from a language standardized for facility of communication, is the brainchild of thought conducted purely in terms of charts, diagrams and company logos. SERO does not just cite this sphere of signets and corporate identity: its inventors are required to follow the laws of their medium and forge, for all their infinite plurality, an identity as a merchantable aesthetic product. The title Scanner++ echoes the plus signs manufacturers use to label enhanced versions of their software, and also calls to mind the programming language C++ which, unnoticed by the programming-illiterate consumers, has been industry standard since the late 1980s onward (2). Its hygienic qualities of 'clean abstraction' (3) and easily replaced program segments are also what SERO is about: the operating rules of data traffic. Blank & Jeron develop a phenomenology of the crossover points between user and computer, they are pathologists of the conventions of thought and the filtration of reality which are, in their view, the tacit prerequisites of electronic information exchange. The prototype of this critique was the project without_addresses presented at the 'documenta X' exhibition in Kassel. The version installed there made engineers of electronic distortion out of visitors, who, seeking the fruits of interaction, entered their names in a field on an Internet home page. Each entry triggered a search engine that hunted through the random profusion of the World-Wide Web for the next best page containing the same name. If a hit was scored, the browser copied the data, and filed an altered version of the document in a database. 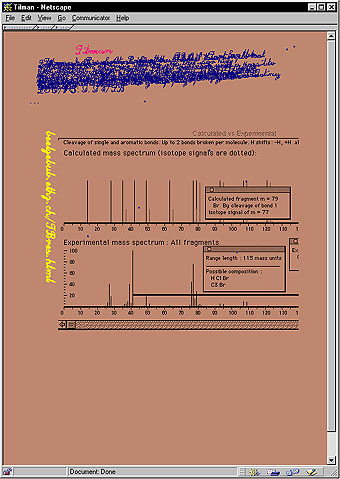 The alteration was implemented by a programmed template that allowed the found electronic material to be broken down into its constituent parts, subsequently placed against a different background colour, then re-composed in a handwriting-like font. Whether self-portrait or advertisement, whether standardized individuality or unsolicited abundance -- all information was equal before the relentlessly stereotyping machine, which lent each document the authentic appearance of a historical manuscript, and thereby rendered null its former legibility. This system profited from the standardized language codes on the Internet, where everything is considered capable of being said, but for the sake of fast transmission no more than a few dozen display formats exist. Like a parody on the utopias of data communication, a self-writing library was produced, a magazine of infinitely consecutive information that followed the pattern of a technological aesthetic and melted down to become an ornament of the medium conveying the original data. Decor is the architecture of the Internet. The message degenerates into superfluous padding for a graphic machinery, and from this Blank & Jeron squeezed the pleasure of an aesthetic game. Cunningly, they presented this archive of lost meaning as a topography: users were not shown the page generated on account of the name they entered, but only a town map. Luminous yellow dots on this map represented an anonymous selection of the existing database. 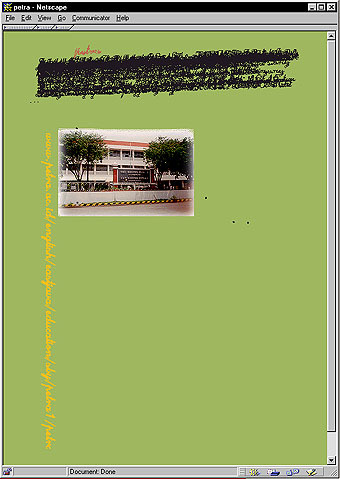 A click on a dot called up a page from the archive of found material. Although its origin was labelled by an address code in the form of a vertical signet, it was no more possible to guess where the page came from than to identify the front of a building in an unknown city. With the formerly strict hierarchy replaced by a physiognomy that flattened out any kind of content, the result was a caricature of the urban and spatial metaphors used by the Internet community, an absurd theatrical display of the slavish faith in letters as a way of ordering data. Shown in this way, the Net not only resembled a copying machine, but even under conditions devoid of purpose or meaning apparently kept up the flow of optical charms which makes it seductive as a repository of attractions. To Blank & Jeron, recycling means to recover a sphere of living reality. SERO makes virtuality and physique the objects of a logical comparison. The abundance offered by the Internet, the infinity described in fervent tones, is made tangible at the expense of its audience, and at the going market prices. The address-free machine transcriptions are offered as auratic silk-screen prints to an astonished audience of collectors who now must bear the burden of procreative information, and have to pick up the tab instead of discharging unwanted data into the oblivion of their computers. In the logic of the archives, there is no such thing as waste disposal. And despite the 'gr\FCner Punkt' (4) that sets the seal of environment-friendliness on the without_addresses home page, SERO does not mean the disposal of waste but the secondary recycling of the latter in the real world with all its spatial limitations. Blank & Jeron's translation of the virtual into the physical rounds off the desire for commercial self-presentation on the Internet by offering in Dump Your Trash! 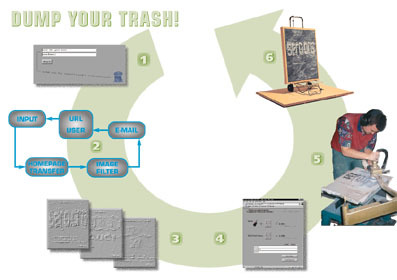 a recycling facility for customers' home pages. Shortly after a customer enters his Web address in the form provided, a collection note arrives. On visiting the SERO server address specified on the note, he will find a counterfeit reproduction of his home page, now looking as if its components have been sculpted in a dark grey, porous sandstone. One's own information offering as a gravestone, scarcely legible, and teeming with dignity. To Blank & Jeron, the Internet means the pursuit of variance without questioning the benefit, and their response to this resembles a threat: those willing to pay the price can have their home page delivered to their front door as a stone-cut marble or granite slab. A transporter in the form of a shopping trolley is available for a small surcharge. All this does more than raise doubts about contents whose quality would scarcely justify such permanence. SERO produces negative forms of electronic material on which the defects in the basic principles of data processing are legible. As moment of inertia, they pit the material conditions of the medium's usage against the belief in the smoothly flowing medium. The automatism of machines is used to question the nature of that primary resource which is destined to become reusable trash on the Net. (1) SERO Entsorgung AG, Berlin, cf. <http://www.sero.de/sero/index/frame.htm>, link 'Das Unternehmen'. (2) C++ was first commercially published in 1985. In the course of the 1980s, the language became widely used in industry and science, and around 1990 the major computer and software producers began to offer their users C++ as standard. While in the 1980s and early '90s the number of users doubled every seven-and-a-half months, the pace of growth has now slowed down, but still points continuously upward. Estimates by one US standardization authority in 1997 put the number of C++ programmers at 1.5 million. (3) Quoted from the supplier's product information. (4) The symbol printed on recyclable packages in Germany.